We hope everyone is doing great! This blog post accidentally slipped through the cracks. Despite that, it is my intention that it will bless and encourage you. As I think about the countless ones who place their babies up for adoption, I commend them for their strength and courage. Indeed, I hope we all can reflect on the true meaning of adoption and what a beautiful gift it is. To all our birth parents, we bless you and thank-you for making such a sacrifice when you place your baby up for adoption. Without a doubt, adoptive parents, we know that you are so thankful for each birth parent’s loving and selfless act. I believe the decision to give up a child must be the hardest choice a person could face. I bless you birth parents and I thank-you adoptive parents for opening your hearts and lives to the beautiful babes. 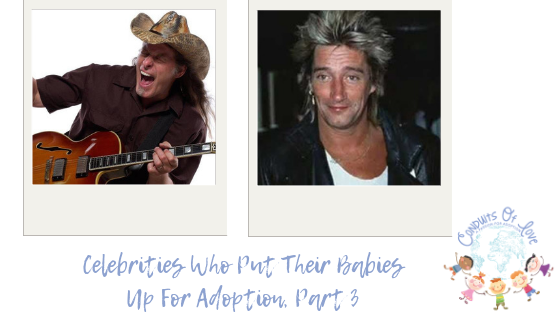 Indeed, we are taking a walk into the world of rock and roll as we learn about two more celebrities who put their babies up for adoption. First is British songwriter and singer, Rod Stewart. Back in 1963, when Rod was a teenager, his girlfriend became pregnant. As a result, she gave birth to a baby girl. Sadly, the girlfriend attempted to provide for the baby for a duration, but was unable to continue. Since she did not receive any help from Rod and could not single parent any longer, the girlfriend put the baby up for adoption. Then sometime in the 1980s, Rod learned about his daughter. He attempted to contact her, but he could not connect with her, Sarah Streeter. Apparently at the time, hard feelings were held by his daughter and her birth mother, Susannah Boffey. Finally, approximately 50 years following the adoption, Rod and Sarah met. Actually, they still keep in touch today. Next is Ted Nugent. He is a guitarist and a political activist. Yes, Ted is a voice to defend our first and second Amendment rights. He also advocates for: guns, freedom, and against drug and alcohol abuse. 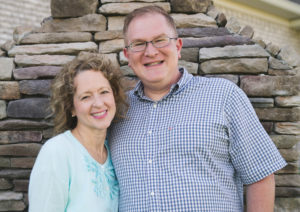 When Ted was young, he and his girlfriend put their son and daughter up for adoption. The children were adopted separately. Finally, in 2010, Ted’s daughter, Louisa, wanted to find her brother, Ted, and her birth father. As a result, the children learned about one another. Thankfully, Ted, Ted, and Louisa have reunited since then. Once again, we have two different adoption stories, but two reunions. We love to hear how when the children want to reunite with their birth parents, that it typically occurs. On the other hand, there are some situations when the children do not want to reunite with their birth parents. Overall, we pray that each adoption story has a happily ever ending for everyone involved. P.S., If you would like to share about a celebrity who put his/her baby up for adoption, please click HERE.